They did not choose the toughest name in the world when they picked the name for Pelle K. When I read in the info sheet that this guy won the Norwegian talent show 'The X Factor', I was quite skeptical before the first spin of 'Bag of Tricks', but it was a amazing experience for me when the magic vocals from Per Fredrik Åsly (which is the vocalist's birth name) was streaming out through my speakers. He is also the vocalist for UK-based band Damnation Angels, and the US-based band The Anabasis btw. Hey...Gosh...Crazy and Fu**ing Awesome is the words that jumps out of my mouth. Kamelot can stop their search and give Pelle K a call and ask if he is ready to take the vocal giant Roy Kahn's place at the microphone in the band! They are compatible to 100%! This is the right man! The instrumental intro song gave me a direct associations to the bombastic American power metal band and with the first vocal song 'Fugue State' he is showing his vibrato and range in his singing capacity. He is not the only vocalist on the disc, with contribution from the great Oliver Hartmann (Hartmann, At Vance) on 'Reason & Psychosis', Amanda Sommerville (Avantasia, Trillium) on 'Send My Message Home' and Tommy Karevik (Seventh Wonder) on 'Stare Into My Eyes' makes this into a big vocal album. Together with the multi-musician / producer Tommy ReinXeed they have done a very tight and elegant production, which is clinical in the sound picture. The melodies are done by the instruction book of melodic metal with the tempo changes and fast power metal rhythm, vocal scales, catchy guitars and ultra melodic choruses. All the eleven tracks are pure and polished gems, but some of the tunes have problems to stand out and it gives me a sense of difficulty to establish a longer desire for just those few songs. It is the only negative I can say about 'Bag of Tricks', which otherwise gives me many smiles and joy. Pelle K's voice got be heard in a bigger and more well-established band in the near future, otherwise they missed out on an upcoming star. The awesome track 'Stare Into My Eyes' is a killer song with the duels between the 2 great voices. Anders Ringdal Strom contributes with his more in a male vocal tone in 'Born In Babylon' and they create a fat and at the same time sensible song with the stunning guitars from Tommy R. The title track is a track, which is light, and languishing with daring melodies that could almost be the signature song for the Olympic games? The final song on the album is a ballad that gives me little chills of pleasure. 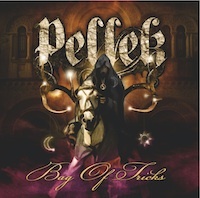 With Marit Borresen, they have arranged a smooth, gentle top song at the conclusion of the 'Bag of Tricks'. If you like top vocal performances with sparkling guitars and a cup of 'radio friendly' Scandinavian Melodic Rock in a wild blend with a bigger dose of Power Metal, this is a art piece you must have in your collection!.